As an avid canoe tripper, visits to Algonquin Provincial Park only happened for me in the summer. Never having visited the park in the winter, I was curious about the park’s winter cross country ski trail systems. After doing some research, I had 4 ski areas to choose from: Fen Lake, Leaf Lake, Minnesing, and Mew Lake Railway. 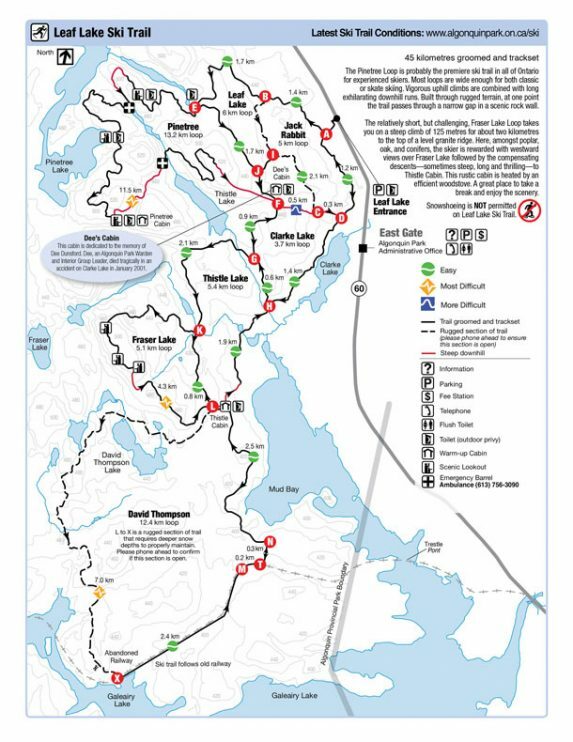 I chose to check out the Leaf Lake trails as they are the largest network, offering a variety of loops for all ability levels. 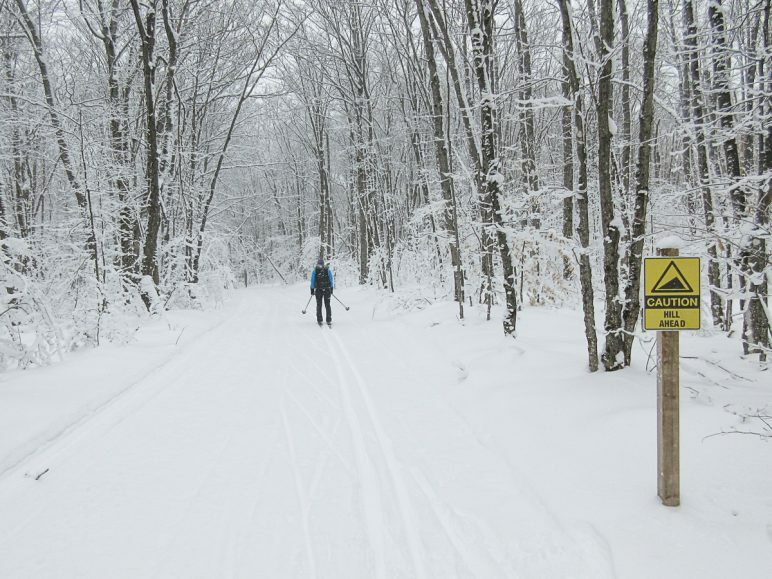 The 45 km groomed and trackset Leaf Lake cross country ski trail network is a cross country ski only trail in the East end of the Highway 60 corridor. 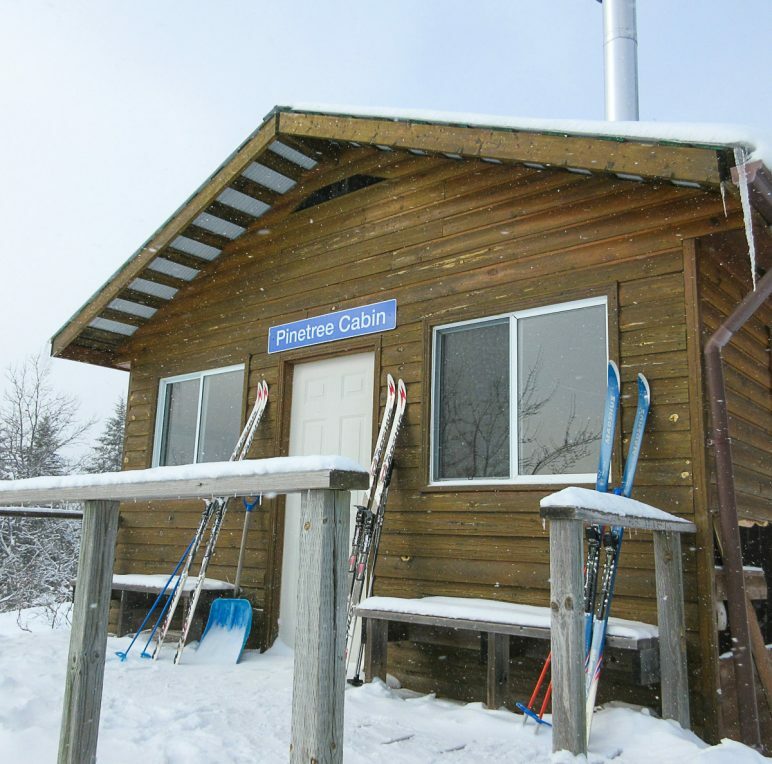 You will need to arrive with your own gear (skis, poles, boots, wax)- rentals available from Algonquin Outfitters at Oxtongue Lake. 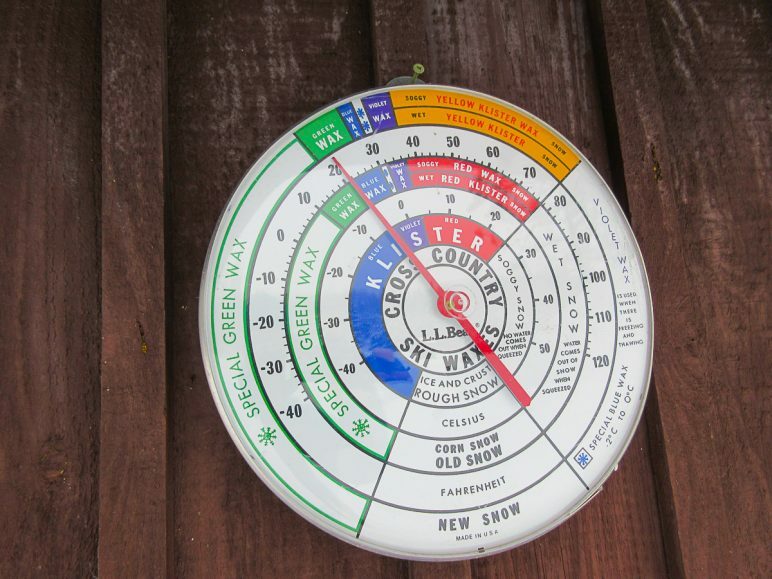 If you have your own skis but forgot your wax and scraper, the East Gate has supplies along with a wax wheel so you can match the wax to the temperature (2km from trailhead). Also, make sure you pick up your day pass at the park gate. Current rates are $17/car. 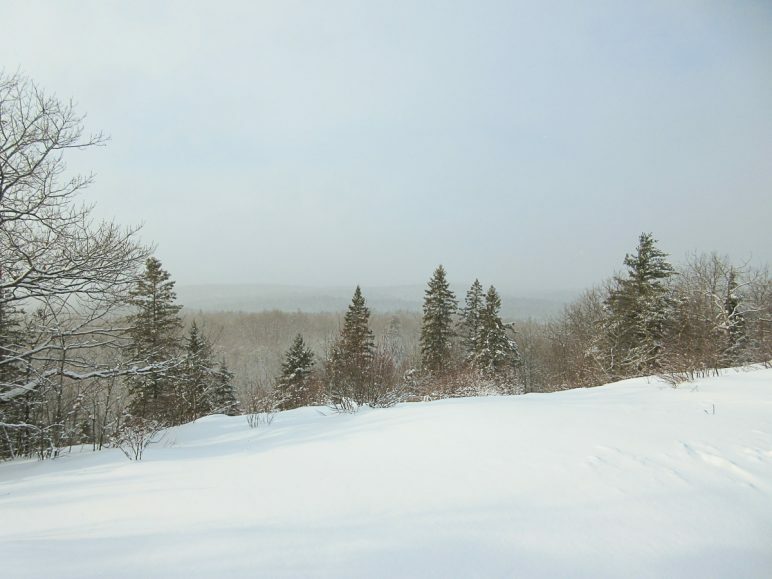 Current ski trail conditions can be found here. There is also a list of open trails listed at the trailhead on a board with the date of the last grooming. Grooming accommodates both skate and classic skiing. 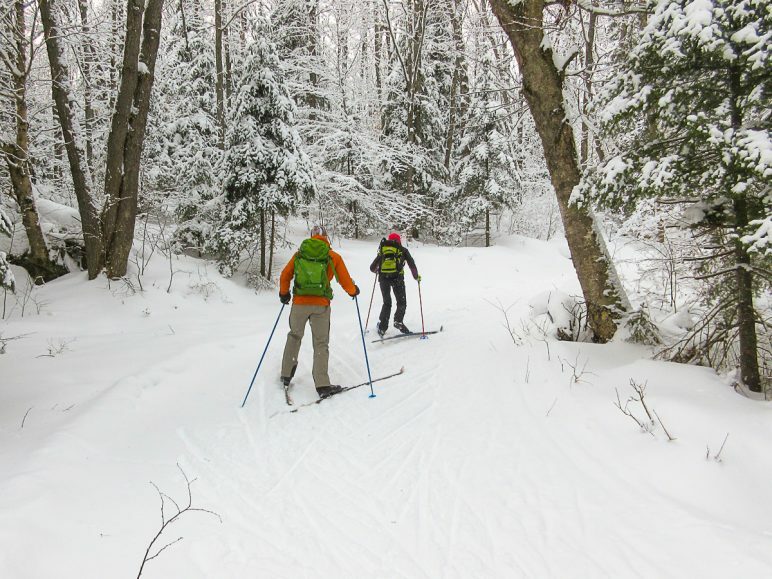 We chose to do the 16km Pinetree loop, dubbed as the premiere trail in all of Ontario for experienced skiers. The rolling terrain is interesting in that it flows from moderate climbs to long fast downhills. Downhill runouts are safe and non-technical. Trails are marked as Easy, More Difficult, and Most Difficult so skiers can select a trail that is appropriate for their ability level. There are 3 rustic cabins along the way: Pinetree Cabin, Dee’s Cabin and Thistle Cabin. All have woodstoves (if you’re lucky, someone has started the fire before you arrive! ), chairs, first aid kits, birdfeeders, outhouses, and enough room to lie down if need be. Between cabins the trails also have a number of outhouses, first aid caches, and scenic lookouts. 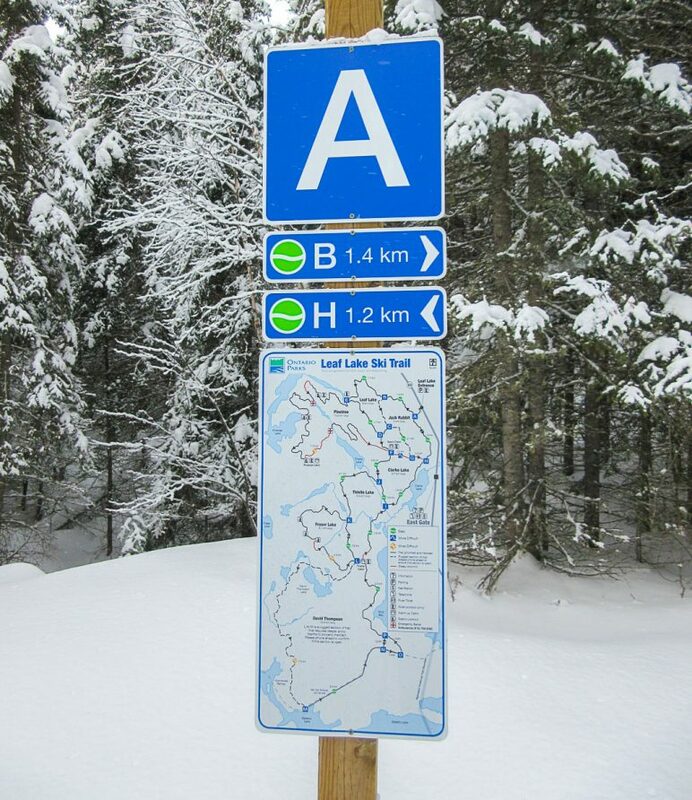 Junctions are extremely well-marked and often include a full trail map with the ‘You Are Here’ arrow. Cabins also have trail maps inside them. I never once felt any worry navigating my way through the trails. Before heading out, I would suggest packing a backpack with you on for on the trail. Items to include in your pack could be: Water, thermos, lunch/snacks, extra layers, cellphones (they work on the trails), camera, headlamp, map, small first aid kid, and survival gear. The shortest loops are 5 km and the longest loop is 45 km, so one may expect to be out for hours. The Pinetree loop took 3.5 hours including lunch for my group. Pack a lunch and make a day of it! If you want to make a weekend of your trip to the park, check out winter yurt accommodations at Mew Lake, or the plethora of lodging options on either side of the Highway 60 corridor in Whitney or Huntsville. Winter camping is also an option if you dare! I thoroughly enjoyed my ski on the Leaf Lake trails and would highly recommend them. The trails are for the most part very sheltered, serene, and scenic. My only lasting thought is…..where is Leaf Lake??? Krista is an outdoor education teacher in Renfrew County. 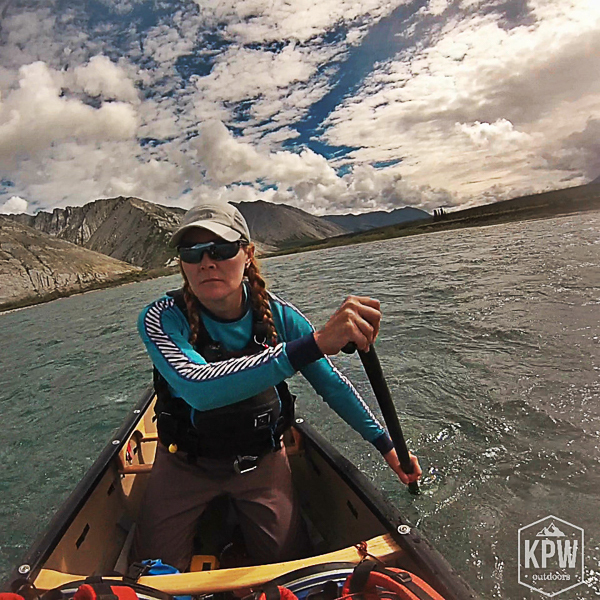 When not introducing teenagers to the wildlands of Ontario, she spends her spare time adventuring all over Canada in both summer and winter pursuits, testing outdoor gear in the process. Read all about her adventures and reviews on her website below!